I originally posted this in April of 2008 but it still holds true (although I did do a little bit of editing). I just got this great book, Living Like Ed by Ed Begley Jr (of television fame). I am in love with Ed :) He has such great suggestions to help make your home/life more environmentally friendly. Each suggestion is rated as to whether it is easy to do, moderate or difficult. His ratings also include an estimate of what it would cost to implement each suggestion. 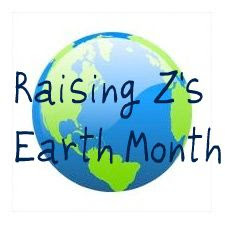 Below I have created a list of 10 easy things moms can do to help our planet. This list is based on suggestions I found in the book Living Like Ed and also the things I try to do each and every day to help our planet. Enjoy the list and please try to do something this Earth Day to help the environment. CFL bulbs use 2/3 less energy than traditional bulbs but provide the same light. They also last up to 9 times longer!!! Each bulb will save you $30 in energy costs over the life of the bulb. They also produce 70% less heat so they keep your home cooler in the summer months. You will save a tremendous amount of water if you turn off the tap while brushing your teeth (and while your husbands shave). By letting the water run you are wasting up to 5 gallons of water per day for a family of 4 (depending on your water pressure and how many times a day you brush your teeth). Most towns have great recycling programs! You can usually recycle cardboard, paper, aluminum and tin cans, glass and most plastics. Please clean out your recyclables well and break down all cardboard. Materials that are not cleaned are treated as hazardous waste and usually end up in a landfill anyway! 4. Reuse Things for Kids Craft ProjectsThere are lots of cool craft projects that you can make out of your recyclables. Paper towel rolls or water bottles can turn into shakers, milk cartons can turn into bird feeders and even dryer lint can turn into bunnies ☺ Check out this website for more cool ideas. Instead of throwing away all of those good clothes, toys and books…pass them on or donate them to people who could really use them. New mothers, Church Thrift shops, The Salvation Army and Mother’s Shelters are always looking for gently used clothing and toys. This uses much less energy and will save you money! There are lots of detergents out there that work very well in cold water. Make sure the load is full before you wash it, this too saves energy and money. Most cleaning supplies are toxic to our children and thus our planet. There are many good brands out there that clean just as well as the toxic kinds. You can also make your own cleaning solutions (there are lots of recipes online). This is a very inexpensive way to reduce waste. All of the grocery stores sell reusable bags for $1.50-3.00 a piece. These bags hold a lot and the stores will take 5 cents off of your groceries for every bag you use. Keep them in the car so that when you go shopping they are always close at hand. When bathing your kids, do not fill the tub all the way. Just make sure there is enough water to clean them well and allow them to splash and play. By not filling the tub all the way, there will be a lot less water out of the tub for you to clean up at the end of bath time. As for yourself, try to limit your showers to 5-10 minutes (I know most moms are lucky if they get 5 minutes). This will conserve a lot of water. It drives me crazy to see people run water while brushing their teeth! I do some of them, not too bad. I loved his show. He is pretty cool. I was happily surprised to see that we have accomplished 8/10 of those ideas!! We are working on going paperless in the kitchen, it is those pesky paper towels that are holding us up!! Oh, and I met Ed Beagley Jr. at the Alternative Fuels in Vehicle conference 2 years ago, very nice man and easily approachable! I will probably see him again when I go this May 9-12 in Las Vegas. I will give him a shout-out from you! Wow! I love that we have done about 7/10 of those things! I think that is a great start! I really need to get better about using the canvas bags at the food store! You're killing me with number 10! I try to do a lot of these things but I love my baths lol. I have a ton of resusable shopping bags but I often forget to bring them with me! Even when I leave them in the car! !